“Old Glory” was given its name in 1824 by William Driver. His mother gave him a brand new American flag to go with him on his journeys. 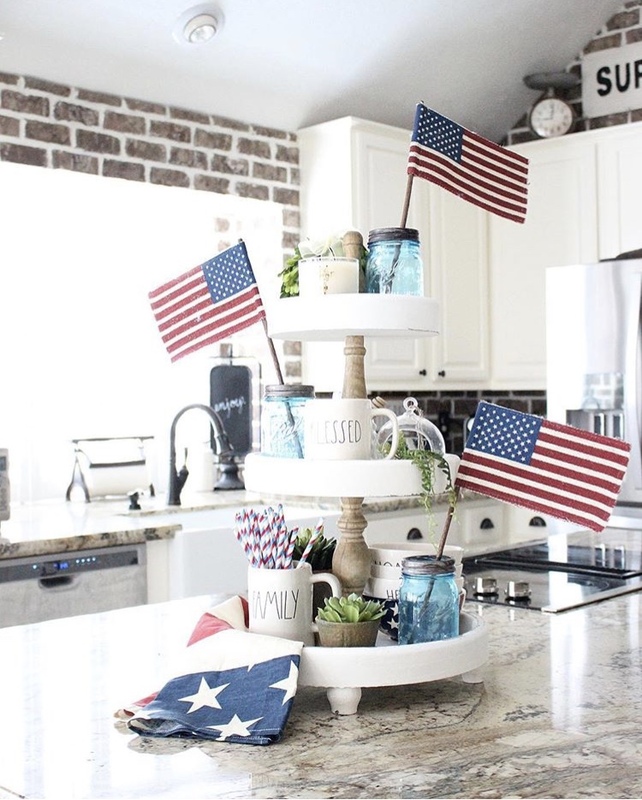 The name stuck and today we are going to honor Old Glory as it plays a big part in decor on a patriotic farmhouse tiered tray. Are you starting to feel patriotic yet? We are, and we can’t wait to share the trending farmhouse tiered tray that friend after friend decorated beautifully. 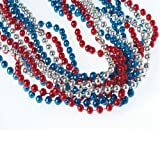 Get ready for a little Red, White & Blue pride! 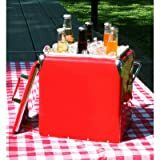 We’re gearing up for the bbq’s, fireworks and celebration of freedom. 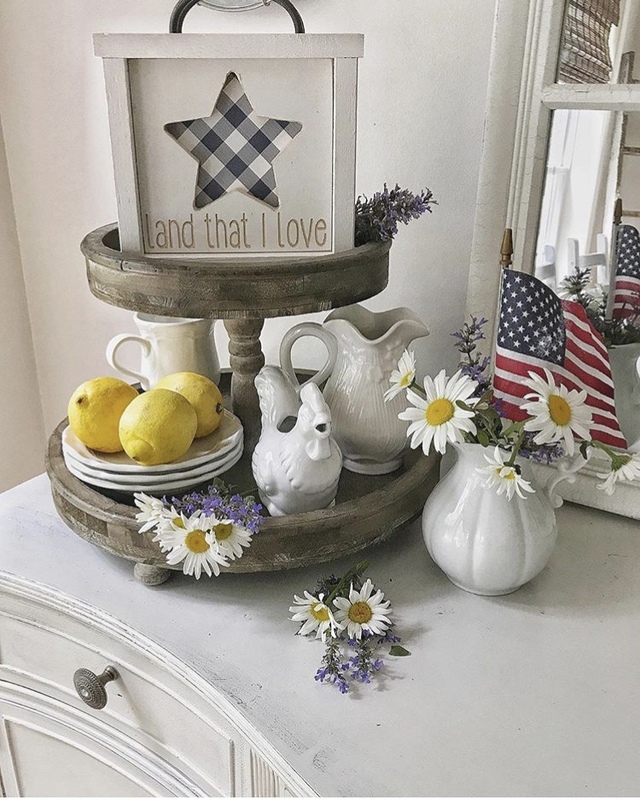 But first, we want to give you a little inspiration for decorating your farmhouse tiered tray. 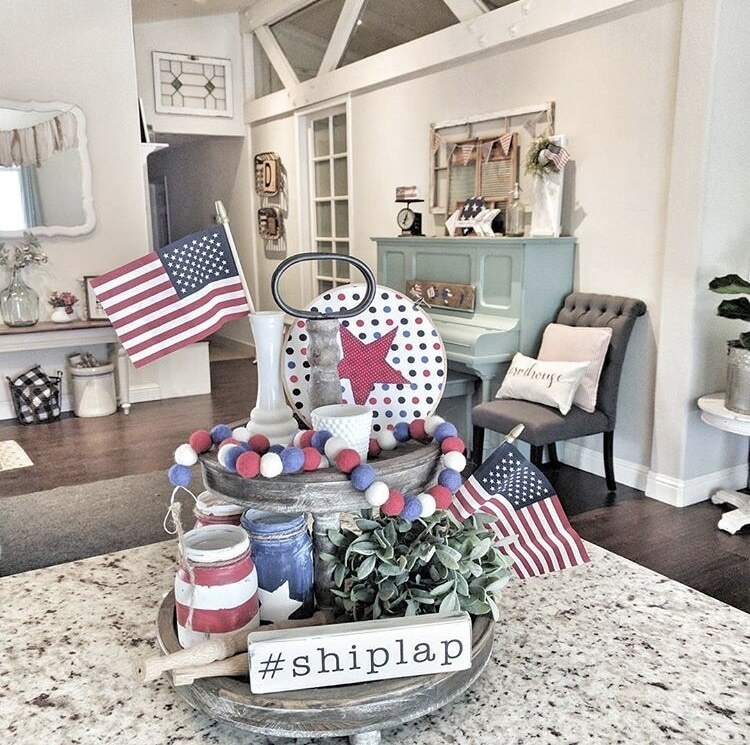 When we reached out to Pam about designing an Old Glory themed tiered tray, she jumped willingly! 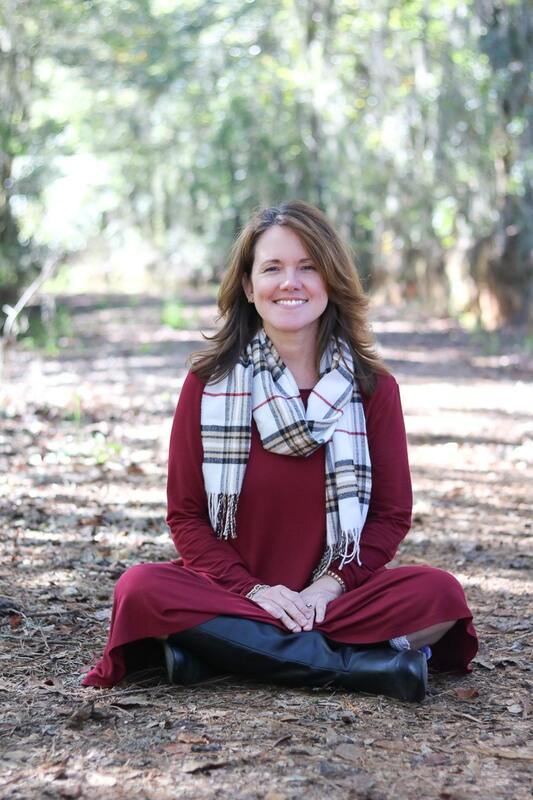 She was in the midst of leading Vacation Bible School at her church, where the theme was “Game On” and focused on Jesus and sports. 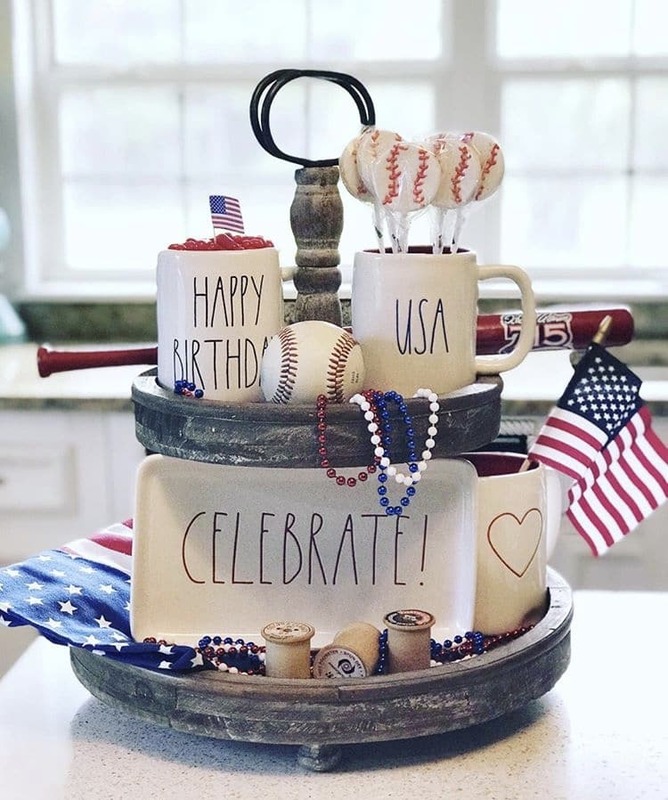 When she incorporated a “Take Me Out To The Ball Game” feel to her tray, the American Pride rushed through our veins! 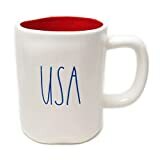 Did you catch the Happy Birthday and USA Rae Dunn mugs? EEK! Take a peek at that Stars & Stripes Forever sign! 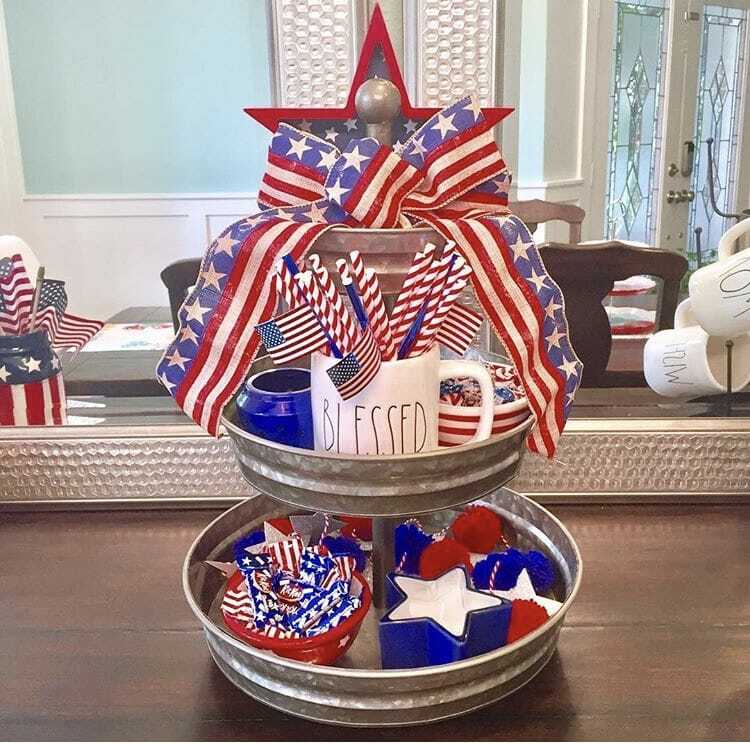 The red, white and blue feels are so lovely in this tray. 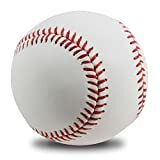 It’s simple, yet beautiful. 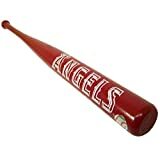 Some of those red pieces would easily be interchanged and used during Christmas. Stop what you’re doing! Do you see the Rae Dunn on this tray? Those berry baskets are our absolute favorite. (if you find them in your local store, we wouldn’t be mad if you bought us a set). Haha! 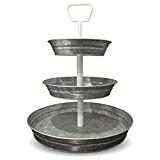 Adding a farmhouse tiered tray as part of a vignette is a great addition to your decor. Since you can’t bring fireworks in your home, choosing an area in a room to add the feeling of fireworks bursting is perfection! 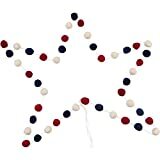 Red, white and blue felt ball garland, star and striped mason jars and a wooden shiplap sign say, “I’m Proud to Be An American.” Don’t you feel the freedom ring just by looking at this tray? All these song quotes on small wooden signs are getting us so inspired. 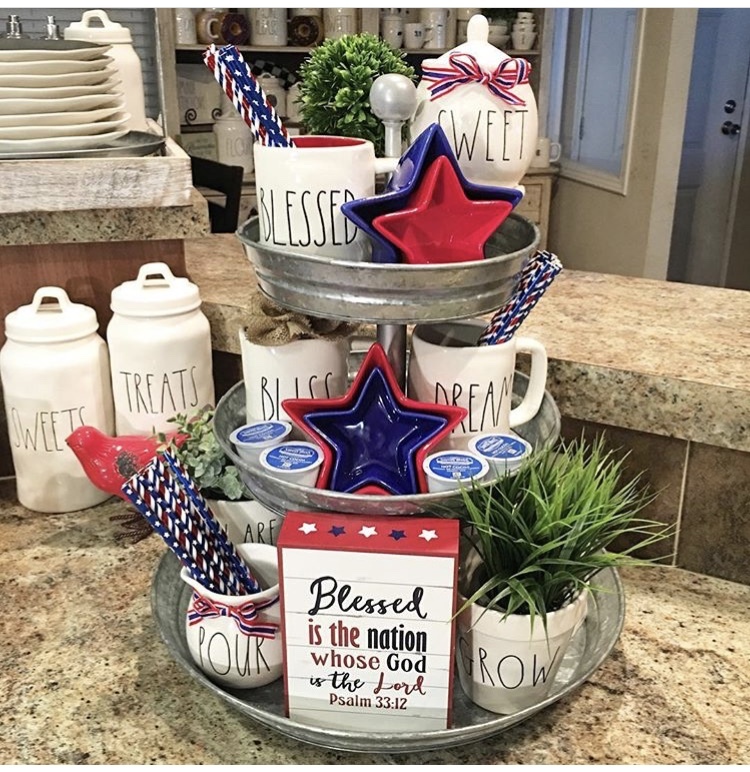 The lyrics of God Bless America on this farmhouse tiered tray strike a cord of pride deep in our hearts. Lemons and daisies add beautiful pops of yellow stars. 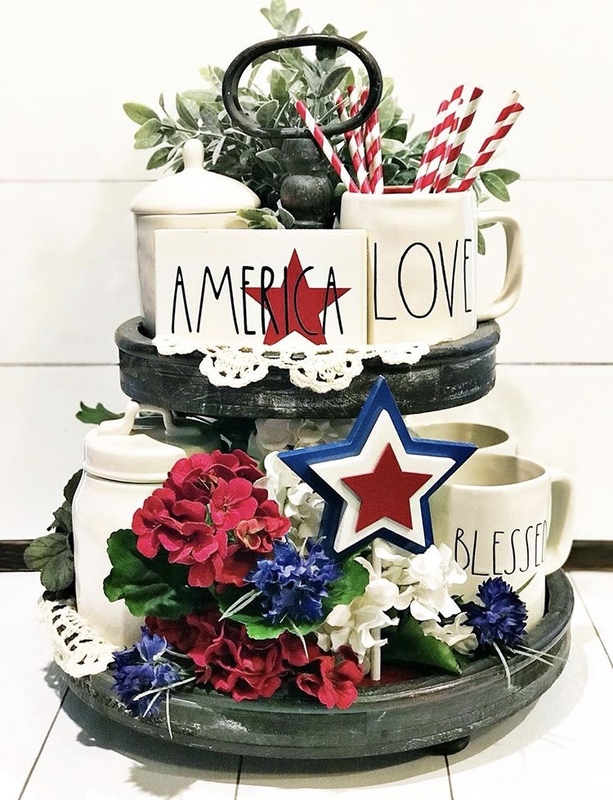 The rustic feel of this tray, mixed with the freshness of red, white, blue and yellow mini banners has our wheels turning of how to miniaturize our banner and repurpose it. 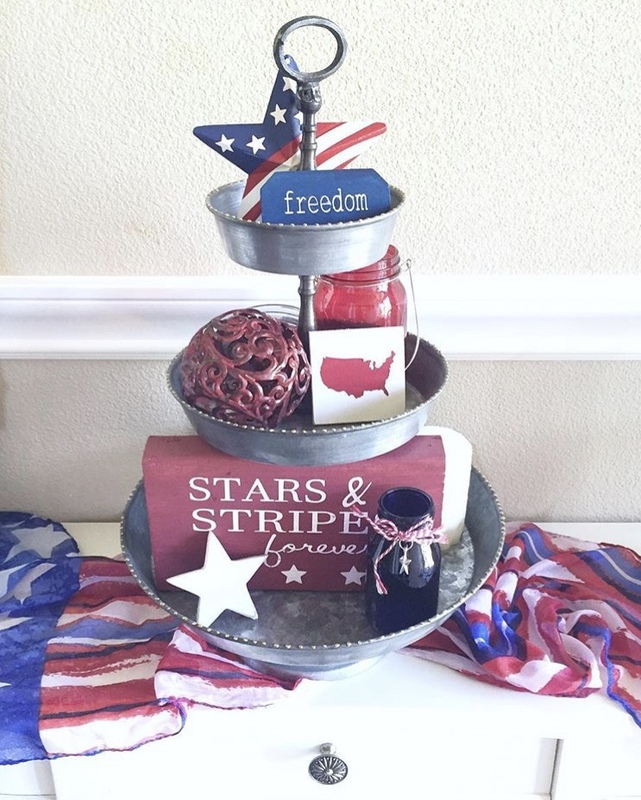 Old Glory is the star on each tier of this tray. 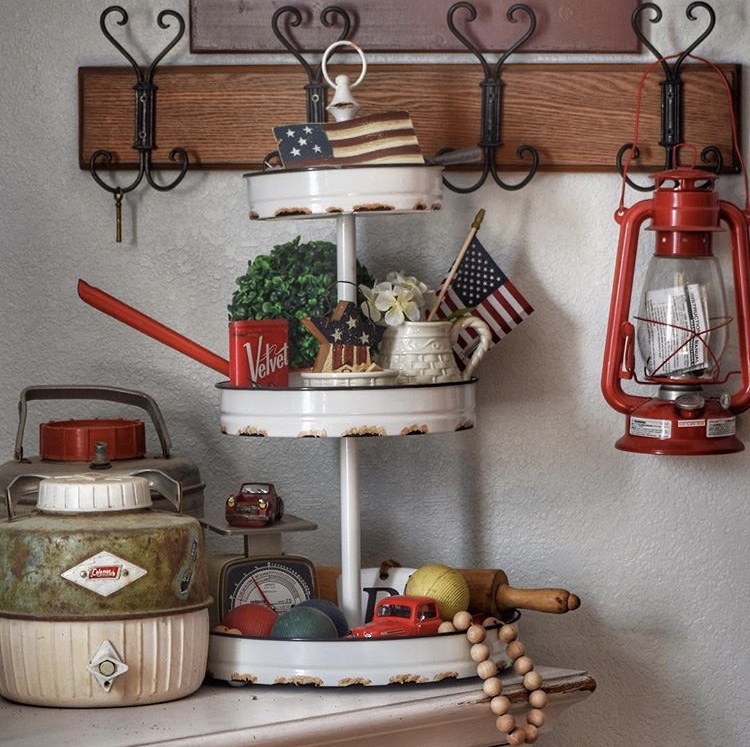 There are so many sweet vintage throwbacks on this farmhouse tiered tray. 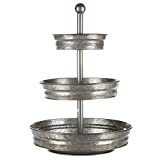 When we chatted about vintage scales in a previous post, did you imagine incorporating it into a tiered tray? Brandy did and added an antique toy car and surrounded it with croquet balls and so many other great American classics. 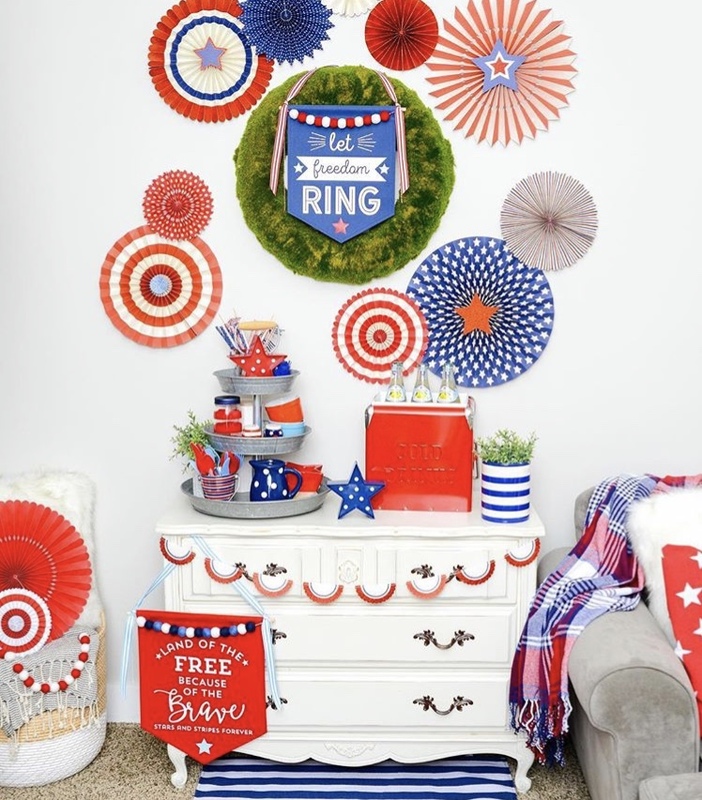 This Rae Dunn inspired “AMERICA” sign is perfect for so many holidays. Kelly has added faux geraniums to her tray and flowers add just the right pop of clothes to indoor decor. 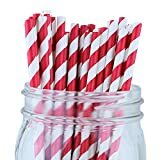 The striped red and white straws also add excitement to this tray. 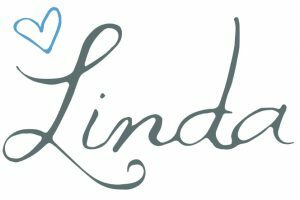 We love that Kelly is always willing to allow us to share her beauties, from our first Holiday Tiered Tray post to our most recent Rae Dunn Tiered Tray posts. It’s always fun to see what she’s up to each holiday. 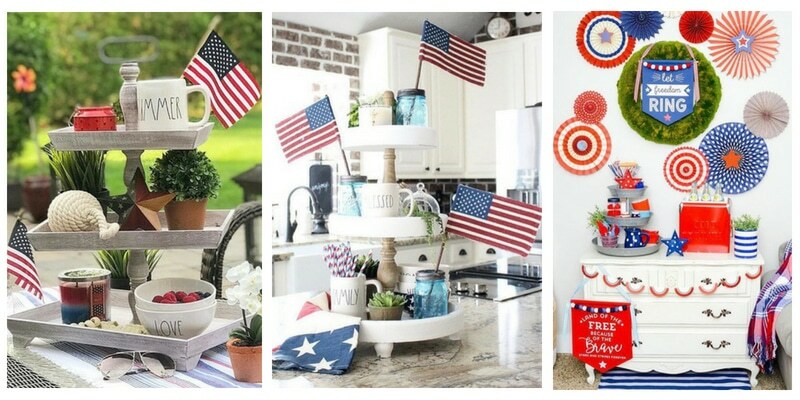 Keeping a tiered tray set up in your kitchen year-round as part of the decor is simple. 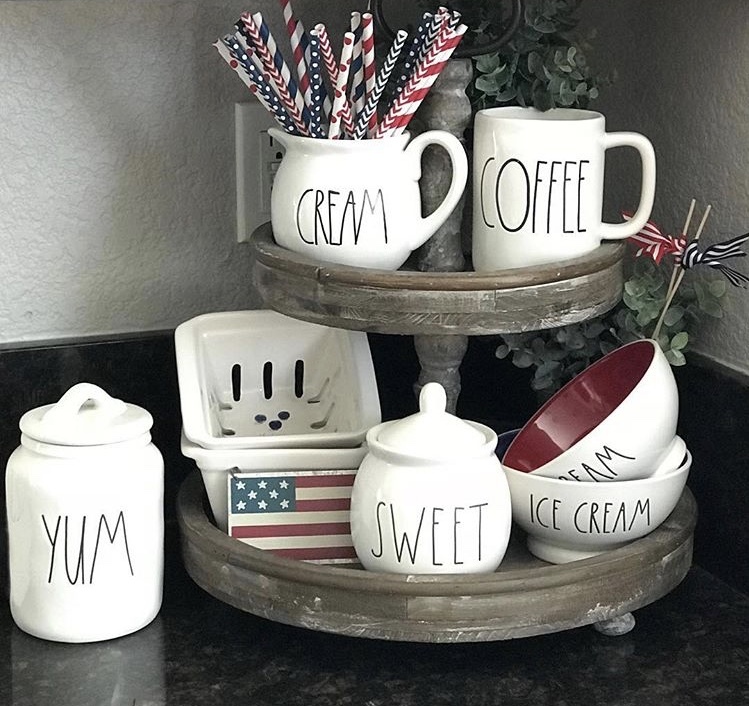 You can change out a piece here and there to give it a fresh new look or a few flags and red, white and blue straws into pieces you already have on your tray. Beth’s tray and kitchen are a sophisticated farmhouse. 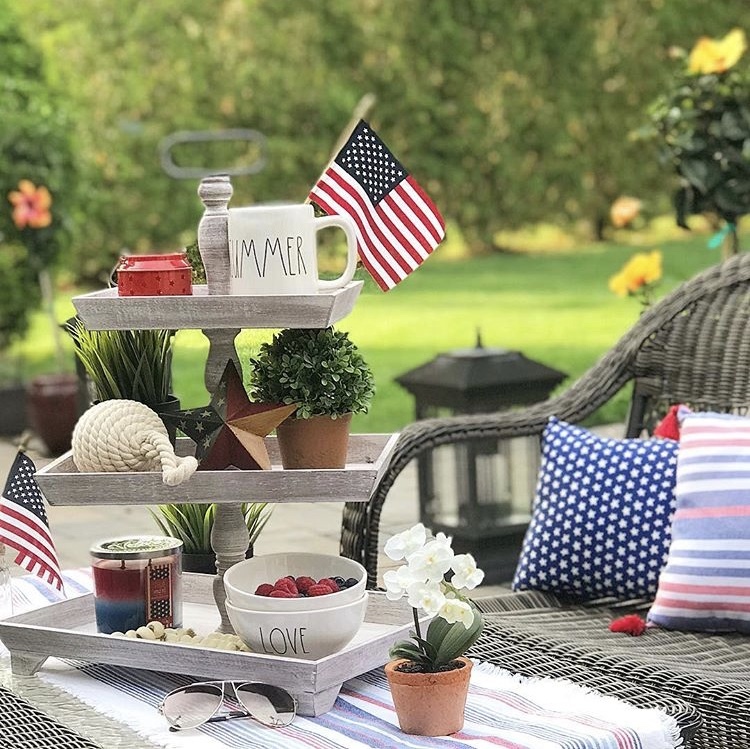 This farmhouse tiered tray looks as though it is waiting for loved ones to enjoy yummy berries and memory making this summer. There’s a nautical hint to this tray that exudes the feeling of lake house onlooking. Boating and the 4th of July go hand in hand. Finding a scripture to pray over our nation is something that we don’t take lightly. We’re loving this one. God, Country, and Rae Dunn are captured beautifully in this tray. Candy and pom garland are a sweet treat on this tray. Valerie is geared up and ready for a summer that will not soon be forgotten. 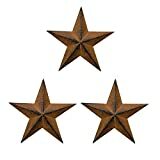 We are Blessed to be in a free country. 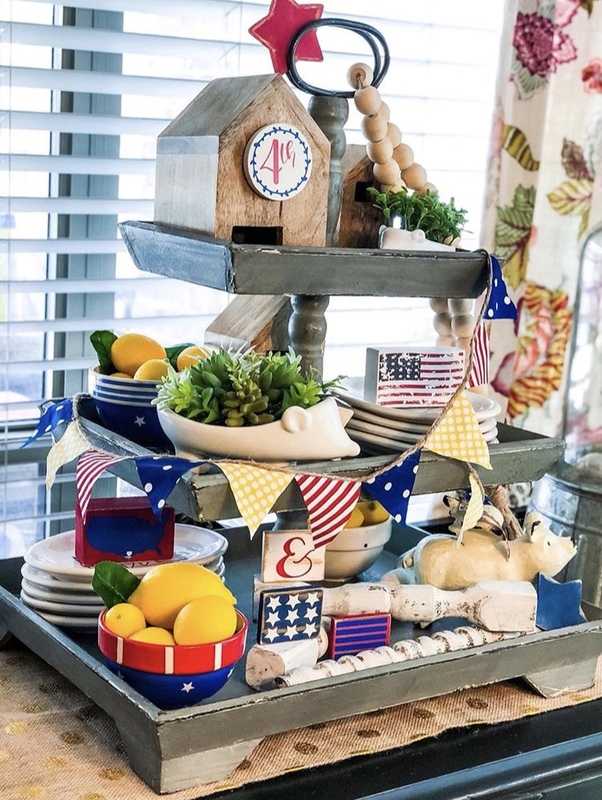 Tag us in your farmhouse tiered tray pictures this summer. We’d love to see how our talented friend’s tray decor inspires you to catch up on the trends.